Saudi Arabia, Iran, the United Arab Emirates (UAE), Qatar, Oman but also Turkey, struggle to acquire geopolitical leverage in the Western Indian Ocean (WIO). Nowadays, the multipolar system which shapes International Relations maximizes the geostrategic relevance of WIO, at the crossroads between Eastern Africa, the Gulf, and Southern Asia. In these waterways, regional and international players share security and energy interests (as freedom of navigation), but they also compete, more and more, for local alliances, commercial ports, and/or military agreements and bases. In the WIO, China and India are designing rival nodes of influence: the Chinese “One Belt, One Road” initiative (OBOR), which adapted the previous “string of pearls” strategy, pushed New Delhi to counterbalance Beijing’s plans with a policy of connectivity in the sub-region. For the Gulf powers, maritime politics enters a new protagonist season: WIO is its basin. The Gulf “pivoted to East” since the 2010s, in terms of energy export, trade and market routes, investments, and infrastructures. Gulf monarchies’ strategies of economic diversification, as the Saudi “Vision 2030”, have further enhanced this trend: would-be post-oil economies need Foreign Direct Investments (FDI) and partners for infrastructural projects. Saudi Arabia and the United Arab Emirates (UAE) pursue a new interventionist and military-driven foreign policy: this pro-active posture has to be supported by maritime power and sea expertise, as demonstrated by the military operation in Yemen. On the other shore of the Gulf, Iran seeks economic modernization and recovery after years of international sanctions: Iranian port throughput increased after 2015. Asian markets can boost trade and investments in Teheran, helping the Islamic Republic to develop a new set of alliances since Iran also aims to upgrade its naval power. 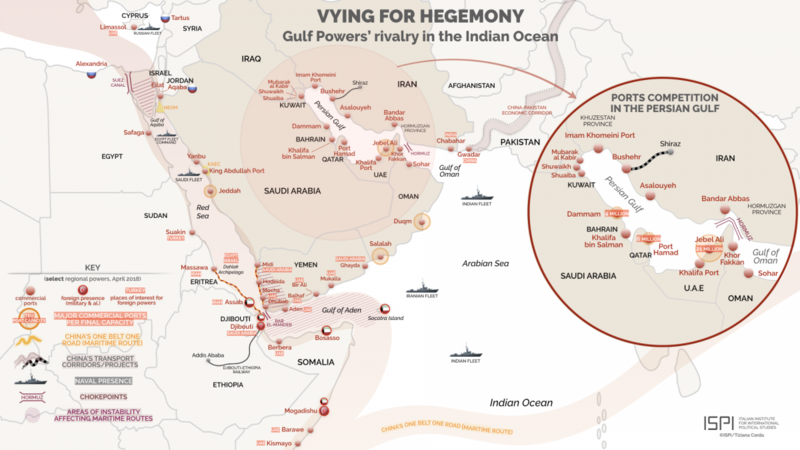 Gulf powers’ maritime competition in the WIO crafts fresh alignments with Asian and Eastern African players, adding to the traditional map of rivalries in the Indian Ocean (India vs Pakistan; China vs India). This intra-Gulf competition can be traced along three vectors of geostrategic influence: commercial ports, military agreements and bases, and choke-points. With regard to commercial ports, it is possible to identify new trends in the Gulf states, all related to the WIO. Gulf monarchies are heavily investing in maritime infrastructures and ports: even Dubai’s Jebel ‘Ali, the regional hub, plans to grow in capacity from 15.60 million TEUs (2) (2015) to 21 million TEUs (2018), with an eye to Expo 2020. Saudi Arabia focuses on logistical infrastructures for containerised exports: in 2016, Saudi ports already registered a remarkable growth in transhipment activity (3). The “Oman Logistics Plan 2020” and the “Sultanate of Oman Logistics Strategy” set a general plan for governments’ investments in this sector. Economic diversification needs to attract foreign capitals and goods: the post-oil economy envisaged by Saudi Arabia with the National Transformation Plan and the “Vision 2030” strategy passes through the rimland. In the Gulf, Saudi Arabia and Oman have massively oil-dependent economic structures: they are investing in the non-hydrocarbon sector, while the UAE and Qatar had already started economic diversification. The development of commercial ports, combined with the establishment of Special Economic Zones (SEZs), can be a vector of economic industrialization and growth. It is the case of the China-Oman Industrial Park in al-Duqm (4), that will produce petrochemicals, cars, and solar panels, including also an oil refinery and a food processing project; or the Saudi Industrial Complex of Yanbu, an oil-export oriented port and SEZ on the Red Sea, where China invested in the new pole for innovation technology (5). Gulf monarchies’ attention for maritime infrastructures supports a new pattern of urban development: commercial ports combined with state-planned cities and mega-projects. This renewed Gulf urbanism embodies state-led growth, but it also needs global capitalism’s investments in order to succeed (6): the newly-constructed King Abdullah Economic City (KAEC), NEOM (7) in Saudi Arabia, and Duqm in Oman are examples of the process of transforming cities into brands (8). In this context, innovative infrastructures, such as global container ports and free zones, also become vectors of post-oil identities: public symbolism supports the Arab Gulf states’ top-down policies of social engineering to promote national awareness and belonging (9). International investors are involved in Gulf monarchies’ ports expansion. The Chinese OBOR initiative contributed to enhancing the centrality of the Gulf in international trade and economy. As a matter of fact, there is complementarity between Beijing’s New Silk Road and Riyadh’s “Vision 2030”: the Gulf is OBOR’s pivot since it joins the Asian maritime route with the European one thanks to a wire of fundamental sea lanes. In this framework, China invested in Oman’s Duqm development, as well as in the enlargement of Khalifa Port in Abu Dhabi: the Abu Dhabi Port signed a 35-year concession agreement with COSCO in 2016 (10). The project for the expansion of Sohar port, in the North of Oman, is an equal joint venture with the Port of Rotterdam (11). During his recent visit to the Gulf (10-12 February), Indian Prime minister Narendra Modi invited India’s businessmen to invest in Omani ports (Duqm, Sohar, and Salalah) and their SEZs (12). Jebel ‘Ali port in Dubai is no more perceived as the unchallenged champion of the Gulf: the traditional “one giant and many smaller ports” pattern is going to be overcome by the brand new “one giant and many would-be giant ports”. The attitude within the Gulf Cooperation Council (GCC) has changed: Jebel ‘Ali remains currently the number one regional hub but, in the medium-long term, a number of Gulf monarchies’ ports (Jeddah and King Abdullah Port in Saudi Arabia, Khalifa Port in Abu Dhabi, al-Duqm and Salalah in Oman) are going to narrow the distances with Jebel ‘Ali in terms of capacities, market share, international investments, and trade connections. According to Elbayoumi and Dawood, the port efficiency index is constantly growing only in four WIO terminals: Dubai, Suez Canal, Jeddah, and Salalah (13). The political rift in the GCC weakens economic integration prospects and, as a consequence, cooperation among commercial ports. The Qatari crisis opened a new chapter in intra-GCC relations, marking the emergence of latent nationalism in the Arab Gulf region: the rising geopolitics of ports is going to further unveil this trend. Due to the neighbours’ embargo, Doha must now by-pass the re-export route of the Jebel ‘Ali. Qatar accelerated the opening of Port Hamad in September 2017, in order to cope with the crisis: the port, built to relieve the overcrowded facility of Doha, will have the final capacity of 6 million TEUs. Port Hamad established weekly service connections with Oman (Sohar and Salalah), Kuwait (Shuwakin), and India (Mundra and Nhava Sheva), aiming to become the re-export alternative to Jebel ‘Ali (14). Qatar also signed a transportation pact with Iran and Turkey to bypass the blockade: in this commercial triangle, the Iranian port of Bushehr is the main hub (15). Ports geopolitics in the GCC emphasizes the decline of the organization and the parallel rise of the Saudi-Emirati diarchy. As a matter of fact, Saudis and Emiratis ports don’t compete with each other: the UAE also invest in the development of Saudi ports, as in the case of Jeddah. The absent/low level of competition between Riyadh and Abu Dhabi in the commercial maritime domain is certainly helped by smooth political relations, but also by geography: Saudi Arabia focuses on Red Sea’s ports (the Saudi Western coast accounts for 70% of Saudi in and out cargo) (16), while the UAE can invest only in the Gulf. With regard to the Red Sea coast, the only nascent rivalry involves two, very close Saudi ports, Jeddah Islamic Port and King Abdullah Port. Established in 1976, Jeddah remains the Saudi main container port (2,4 million TEUs to reach 4 million TEUs) (17): but King Abdullah Port has quickly become the second one, a bright star in the framework of the new King Abdullah Economic City (KAEC). It is the first privately owned and funded port in Saudi Arabia, thanks to a joint venture of Saudi Binladin Group and Emaar. King Abdullah Port should reach a final capacity of 10,7 million TEUs (currently is about 3 million TEUs) (18), with an expected increase in export/import of steel from Asia to 11 million tons per year in 2020 (currently at 8 million tons per year). In the Red Sea, the Suez Canal aims to enhance traffic and investments after the expansion completed on August 2015, Eilat port in Israel is planning to double its cargo shipping (19), while Aqaba port in Jordan (which also hosts Jordan’s small navy) shows a negative index of competitiveness, with a contraction of market share since 2009 (20). Competition among Gulf ports is leading to an overcapacity risk looming in Northern Gulf. Looking at the map, a real “ports bulge” is here in the making: eight developing ports are located along the Arabian shore of the Gulf (Dammam, Shuwaikh, Shuaiba, Mubarak Al-Kabir, Khalifa bin Salman, Port Hamad, Khalifa Port, and Jebel ‘Ali), four on the Iranian one (Imam Khomeini Port in Khuzestan, Bushehr, Asalouyeh and Shahid Rajaee in Bandar e-Abbas, Hormuzgan Province). Kuwait, Qatar, the UAE, and Oman have been consistently investing in ports expansion, and Saudi Arabia is also enlarging King Abdulaziz Port in Dammam (final capacity of 4 million TEUs), the gateway for Saudi mainland imports. All Kuwaiti ports are under restructuring (21). Shuwaikh, the main commercial port, will be upgraded, as well as the second one, Shuaiba. But the real game-changer is Mubarak al-Kabeer Port (and its related Free Zone) on the Bubiyan island (22). This facility, with a planned capacity of 3,6 million TEUs, was contested by Iraq for a long time, given its proximity and potential competition with the Iraqi Grand Port of Al-Faw, currently under construction in Basra: Iraq’s National Investment Commission (NIC) included the port in the list of major strategic projects at the International Conference for Iraq Reconstruction held in Kuwait on February 2018 (23). The major port of Bahrain, Khalifa bin Salman Port (24) (1,1 million TEUs) is a recent infrastructure, fully operational since 2009 and connected to Saudi Arabia by the King Fahd Causeway: it is very close to the Iranian Asalouyeh port. Qatar has just opened Port Hamad. With regard to Busher, China signed for the construction of the railway connecting the port with Shiraz, in inner Iran: this anti-Chabahar deal will ease supply towards Central Asia (25). In the UAE, Khalifa Port in Abu Dhabi, the first direct competitor of Jebel ‘Ali, decided to expand its capacity too (to reach 6 million TEUs): it was announced six months later that of Jebel ‘Ali. Located in Bandar-e Abbas, the Shahid Rajaeed Port is the Iranian principal container facility, with a capacity of 4 million TEUs: it will be expanded to 6 million TEUs, in the framework of a general, post-2015 modernization and enlargement of Iran’s ports infrastructures (26). In the Gulf of Oman, Khor Fakkan (Sharjah emirate, UAE) and Sohar (Oman) benefit from the “beyond Hormuz” factor. 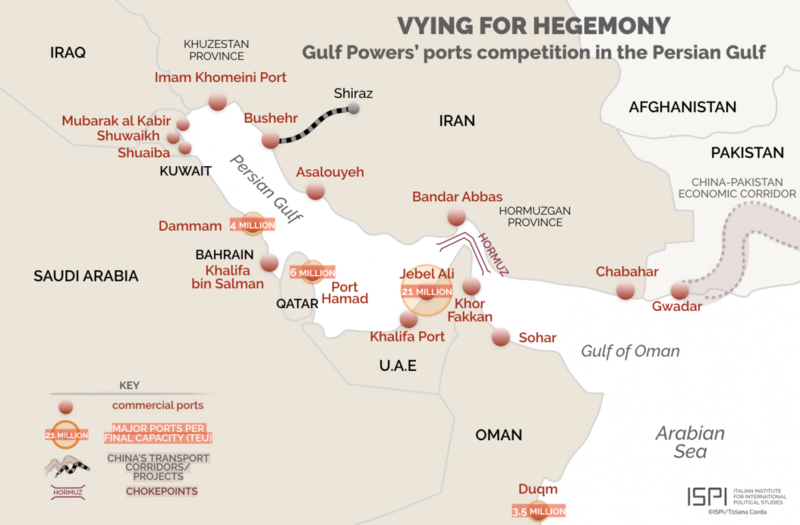 These rising ports are placed out of the Strait of Hormuz: they would not be affected by a hypothetical, temporary interdiction of the passage or by threats coming from the area. Khor Fakkan (27) (3,4 million TEUs) is the only Emirati port located beyond Hormuz, with a brilliant competitiveness index (28), plus a clear trade projection towards the Indian sub-continent and Eastern Africa. Sohar (2 million TEUs), in the Omani Batinah valley’s coast, is focused on transhipment across the Arabian Peninsula. With regard to Oman, al-Duqm is the pillar of the Sultanate’s strategy of post-oil development: its construction is reportedly completed at the 85% (with a final capacity of 3,5 million TEUs) to become the Gulf’s export hub for industrial materials (29). The most Southern Omani port, Salalah in Dhofar governorate, is under restructuring too, with the construction of new berths. This transhipment linchpin, geographically projected into the Arabian Sea, has a capacity of 5 million TEUs, but it is going to reach 7,5 million TEUs (30). As a result, the redesigned map of Gulf’s ports highlights new competitors for Dubai. Given their locations, capacity, trade routes, and re-export vocation, Abu Dhabi’s Khalifa Port, al-Duqm, Chabahar in Iran (co-financed by India), and most of all the Pakistani Gwadar in Baluchistan (co-financed by China) are likely to become direct rivals for Jebel ‘Ali, attempting to erode its consolidated position in international maritime trade. Among Middle Eastern players, the United Arab Emirates are the most active actor in the “Aden regional security complex”: they combine and often overlap commercial interests with military ambitions. According to Al-Maashi, two strategic naval fringes surround the Bab el-Mandeb Strait. The first fringe starts from the port of Midi (North West of Yemen) down to the port of Do’bab, adjacent to the strait, and it also extends to the opposite Eastern African coast, from the port of Massawa (Eritrea) to the port of Djibouti. The second fringe starts from the Gulf of Aden along Yemen’s Southern coast to the port of Daba in Hadhramaut, and runs in parallel along the Northern coast of Somalia, from the port of Berbera (Somaliland) up to the port of Bosaso (Puntland) (31). Nowadays, the UAE are able to project influence in both strategic fringes: Abu Dhabi designed an ambitious “string of ports strategy” amid Southern Yemen and the Horn of Africa. This maritime scheme resembles China’s OBOR initiative: Dubai Port World (DP World) won concessions for the management of commercial ports in Eastern Africa: Djibouti (32), Berbera (Somaliland), Bosasso (Puntland, P & O Port, a subsidiary of DP World), Kismayo (Jubaland), and Barawe (South Western State, Somalia). The Turkish company Albairak operates the port of Mogadishu. The Emirati federation demonstrated a pragmatic stance vis-à-vis Somalia, signing agreements with the federal government (the military training centre in Mogadishu), as well as with other administrations (i.e. Somaliland and Puntland): on the contrary, regional players such as Turkey engaged only with the federal government (33). In Southern Yemen, the UAE capitalized on the ground intervention against the Houthis and Al-Qaida in the Arabian Peninsula (AQAP) to exert influence (34) also on local ports: Al-Mokha, Aden, Balhaf, Bir ‘Ali, and Mukalla. The Emiratis established a remarkable presence in the archipelago of Socotra, at the centre of the Indian Ocean, announcing the construction of the Zayed Residential City (35). Aden and Mukalla in Hadhramaut are significant commercial ports, while Balhaf in Shabwa is focused on oil-export: in October 2015, DP World returned to operate the port of Aden, as it was until 2012. Under the banner of the “Sons of Hadhramaut”, AQAP managed to rule Mukalla for a year (2015-16), exploiting port revenues (36). Strategic reasons behind UAE’s string of ports policy reflect three dynamics. First of all, the rise of direct competitors for Jebel ‘Ali: this would push Abu Dhabi to explore other, complementary maritime-commercial routes in the Indian Ocean. Secondly, the Emirati leadership enhanced economic ties with Asian powers and markets (as India, China, and South Korea) and thus seeks for strategic depth in the WIO: this long-term shift is stressed by the UAE-India Partnership Agreement signed in January 2017. Thirdly, such a commercial strategy, coupled with the military one, aims to draw with Saudi Arabia a “security belt” of ports and/or military bases against Iran in Southern Yemen and Eastern Africa. The Saudis managed to directly control only Midi, the Northern Yemeni port at the border with Jizan in the kingdom, and Ghayda, the most Eastern port in the contested region of Mahra. Yemen’s Houthis, supported by Teheran, still occupy Hodeida, a prominent port on the Red Sea. Gulf and Middle Eastern states have been constructing, or they have just opened, military bases in the WIO sub-region: it is something new, also because this is a highly Western- (and now even Asian-) penetrated area. Saudi Arabia is going to establish a military base in Djibouti to support commercial sea lines and military projection in the Bab el-Mandeb and the Red Sea, as well to secure freedom of navigation in the strait. In 2016, the UAE opened a permanent military base in Assab, Eritrea: it encompasses port-support facilities and air bases. The Emirates are building a naval and air base in Berbera, Somaliland: it will become the second Abu Dhabi’s military hub in Eastern Africa. For Saudi Arabia and the UAE, these are the first-ever military outposts abroad: a choice reflecting their new assertive foreign policy in the Middle East, with specific emphasis on the development of blue-water capabilities. Notwithstanding expensive investments, Riyadh – more than Abu Dhabi – needs to strengthen naval capabilities and coordination among commands, stressing command-control-communication skills and training for military personnel: not by chance, the Saudis are developing close relations with the Indian Navy (37). The war in Yemen accelerated the Saudi-Emirati route towards the WIO: the UAE base in Assab is strategic to enforce the blockade against Yemen’s Huthis and was the platform for the amphibious assault to regain two Red Sea islands from the insurgents. Moreover, the Gulf states finalized security agreements with coastal countries (the UAE with Eritrea, Iran allegedly with Eritrea and Tanzania, Saudi Arabia with Djibouti); the Emiratis have also tight military cooperation with Seychelles (38). In September 2017, Turkey opened a military base in Somalia, after the inauguration of its first military base abroad in Qatar (2016). According to public statements, 200 Turkish militaries will train soldiers of the Somali National Army (SNA), fragmented among rival clans. For electoral purposes, the former Mogadishu government refused to define the Turkish hub as a “military base”, opting for a “training installation” aimed to improve Somali soldiers’ professionalization against the threat coming from Al-Shaabab. The Turkish ambassador to Somalia simply refers to the outpost as a “military training camp” (39), so downplaying power projection’s aspirations. Iran is reportedly seeking enhanced naval presence in the area and declared the willingness to establish a naval base in Yemen: the Huthis, the Yemeni movement and militia supported by Iran, still control the Hodeida port in the Red Sea. Russia would aim to restore a military presence in Aden. Looking at recent geopolitical alignments, Turkish military presence in Somalia could ease Qatari and Iranian access and presence in WIO, thus weakening the Saudi-Emirati “security belt” strategy designed amid Southern Yemen and Eastern Africa. The Gulf states are subtly vying to control choke-points, first of all, the Bab el-Mandeb, but also Suez’s Red Sea entry. In the Bab el-Mandeb, freedom of navigation faces consistent challenges: Yemen’s Houthis attacked Emirati, Saudi, and American navies, and sometimes commercial vessels, between the Red Sea and the Gulf of Aden, using missiles, rockets, explosive drone-boats, and water mines. Piracy has also resurfaced: 2017 saw the highest number of episodes since 2012. For instance, a UAE oil tanker and later an Indian merchant ship were hijacked by pirates along the Somali coast (March 2017 and April 2017); in the Gulf of Aden, a Chinese frigate succeeded to prevent Somali pirates from assaulting an UAE-owned oil tanker (April 2017). In Hormuz, skirmishes between Iran and the United States are on the rise: Saudi Arabia and the UAE are diverting geostrategic investments on the other maritime side of the Arabian Peninsula, to counter asymmetrical menaces as well as to achieve regional goals. The militarization of the Red Sea reflects this emerging trend: Saudis, Emiratis, Egyptians, Iranians, and Turks established or attempted to carve-out territorial niches for geostrategic influence. As previously stated, Saudi Arabia’s military base in Djibouti and the UAE’s outposts in Eritrea and Somaliland allow them to project power and secure navigation in the Bab el-Mandeb Strait. In December 2017, Turkey obtained the temporary transfer of the port city of Suakin from Sudan: Turkey and Sudan agreed to build a dock to maintain civilian and military vessels, signing a pact that “could result in any kind of military cooperation” (40). Eritrea is at the centre of crossed Middle Eastern geopolitical games. For strategic purposes, Israel would lean on a naval hub and listening station on the Eritrean islands. Egypt would be in talks for the use of a military outpost at Nora locality (Dahlak island): Cairo denied rumours regarding the establishment of a base in Eritrea. However, Emirati-backed Egyptian forces arrived in Eritrea on January 2018 to counterbalance Turkey’s presence in Suakin (41). Egypt has just opened the new headquarters of the Southern Naval Fleet Command based in Safaga: Cairo has four warships in the area of the Bab al-Mandeb strait as part of the Saudi Arabia-led coalition in Yemen (42). Since 2011, Iran has regularly deployed naval forces in the Red Sea, presenting them as anti-piracy missions. The Islamic Republic of Iran Navy (IRIN) and not the Iranian Revolutionary Guard Corps Naval Forces (IRGCNF) is tasked with “out of Gulf” naval operations. Notwithstanding a surge in maritime activities, Teheran’s naval capabilities in this area are not comparable with those displayed in the Gulf so far. But the military rise of Ansarullah in Yemen, an actor who adopts asymmetrical warfare, put the Bab el-Mandeb region into Teheran’s geopolitical radius. For the Iranians, the Red Sea is a prominent route for weapons smuggling to Syria and Gaza: Iran’s ships use to dock in Massawa and Assab ports (43). New maritime geographies have appeared: the UAE built an airstrip in Perim/Mayyun (Yemen’s Red Sea island), just in the middle of the Bab el-Mandeb strait, plus a military training camp in Socotra island for Emirati conscripts. Socotra is a likely commercial platform towards India, plus an anchor for maritime security and/or projection. Since Egypt ceded Tiran and Sanafir islands to Riyadh, Saudi Arabia controls now the access to the Gulf of Aqaba: Saudi soldiers replaced the Egyptians in Tiran (44). Saudi Western Fleet is also based in Jeddah, out of the King Faysal Naval Base. Riyadh is going to include Saudi Red Sea’s islands in the NEOM project amid Northwest Saudi Arabia, Egypt (Sinai), and Jordan. Russia’s come-back in the Mediterranean is more than evident: beyond the long-time naval base in Tartus, Syria, Moscow negotiated access to two new berths in choke-points areas: Alexandria in Egypt, Aqaba in Jordan, Fujairah in the UAE (beyond Hormuz), plus a previous deal regarding Cyprus’ ports. Perspectives: Gulf Monarchies’ Infrastructural Outreach in the Mediterranean? This competition among Middle Eastern and Gulf players (Saudi Arabia vs Iran; Saudi Arabia-UAE vs Qatar; Turkey vs UAE-Egypt) can be traced along three vectors of geostrategic influence: commercial ports, military agreements and bases, choke-points. The Arab Gulf states are heavily investing in maritime infrastructures and ports, with an eye to economic diversification processes. The Jebel ‘Ali port in Dubai is no more perceived as the unchallenged champion of the Gulf. Currently, Jebel ‘Ali remains the first regional hub but, in the medium-long term, a number of Gulf monarchies’ ports (Jeddah and King Abdullah Port in Saudi Arabia, Khalifa Port in Abu Dhabi, al-Duqm and Salalah in Oman) are going to narrow the distances with Jebel ‘Ali in terms of capacities, market share, international investments, and trade connections. The political rift in the GCC weakens economic integration prospects, fostering competition among commercial ports (45). The great number of neighbouring, ambitious maritime infrastructural projects can boost mutual development, but it is also leading to overcapacity since a real “ports bulge” is looming in Northern Gulf: to avoid this risk, sub-regional ports need to identify and develop competitive edges. In this framework, competition is likely to grow in the UAE federation between Abu Dhabi (Khalifa Port) and Dubai (Jebel ‘Ali), as well as between the Emirati and the Omani commercial ports. In WIO, big infrastructural projects as the ports of Gwadar and Chabahar are going to further enhance rivalries among Gulf players, testing leading Dubai’s ranking resilience: the Pakistani Gwadar is supported by China and attracts investments also from Saudi Arabia (46), while the Iranian Chabahar is sustained by India. From a geostrategic perspective, India is increasingly tied to Oman and the UAE: New Delhi aims to build a military base in Seychelles, an area highly influenced by the Emiratis and the Indian Navy signed to use the port of Duqm for logistics, support and maintenance (47). In the GCC, the Saudis focus on the upgrading of the commercial and military presence in the Red Sea, while the UAE project themselves amid the Bab el-Mandeb and the Indian Ocean: this choice also confirms the emerging Saudi-Emirati diarchy, which de facto replaced the GCC since the eruption of the Qatari crisis. The rising militarization of the Red Sea and Eastern Africa, as a result of Gulf and Middle Eastern rivalries, may alter local equilibriums, reigniting persisting enmities: Eritrea, Sudan, and Somalia are at the centre of this geopolitical game, with sensitive implications for international security and maritime balances. As mentioned before, the current pivot of Saudi economic projects (as KAEC and NEOM) is in the Red Sea: the Sinai peninsula’s instability becomes a direct threat to Saudi national security. Riyadh will likely enhance its geopolitical involvement not only in the Red Sea waterway but also in the security of Sinai, a goal shared by Saudi Arabia, Egypt, Jordan, the UAE, and Israel. Mega-projects can help stabilization and maybe shared prosperity, thus reducing security threats: if realized, NEOM could play a “soft securitization” role. Saudi Arabia and Egypt agreed to set up a joint $10 billion fund to develop areas of Egypt (South of Sinai) linked to the NEOM project (48). Will the Emirati and Saudi commercial-maritime strategy expand to the Mediterranean? Southern Europe and North Africa might represent interesting targets for Gulf monarchies’ strategic influence (49). Saudi Crown Prince and Defence Minister Mohammed bin Salman’s recent visits to France and, most of all, Spain, highlighted the Saudi “maritime trend”. On April 11-12, Saudi Arabia signed a complex defence agreement with Spain: it will encompass not only the selling of five warships “Avante 2200” and military training for hundreds of Saudi marines, but Spain will also restructure the port of Jeddah, where the Saudi Western Fleet is based (50). Looking at ports geopolitics, signals are still intermittent, with the Emiratis as the most active player so far. In 2014, Saudis, Emiratis, Qataris and Kuwaitis created the Wessal Capital, an investment fund for Morocco: Gulf powers focused on the development of Casablanca Port (51). Nevertheless, it was, first of all, a way to strengthen the monarchical front to cope with the Arab uprisings. The UAE’s maritime outreach in the Mediterranean looks at Cyprus, Libya, Spain, and recently France. DP World encompassed the Cypriot port of Limassol in the Emirati “string of ports” obtaining, on April 2016, a 25-year concession to exclusively operate in the terminal (52): the Republic of Cyprus, a European Union member, is located just at the entrance of the Mediterranean Sea. Moreover, Abu Dhabi established an air facility near Benghazi, in Eastern Libya. In Spain, Dubai-owned P&O Maritime announced the acquisition of Remolques y Servicios Maritimos (Reyser), a Spanish company providing maritime services internationally: Reyser has long-term agreements with 12 ports in Spain (53). DP World recently won a three-year management contract to operate the container terminal in the Port de Sète in the south of France (54). Previously, the UAE focused on Algeria: DP World operates two ports in the country, Djazair and Djen-Djen: in 2008, the Emirati company was awarded the 30-year concession to operate the container terminal in the Port of Algiers (55). DP World and the Israeli Zim Integrated Shipping joined for the acquisition of Spanish port operator Contarsa in 2008 and the assumption of joint control of the Container Terminal at Tarragona (56). Beyond the Piraeus and Thessaloniki, Greece intends to privatize ten smaller ports: among them, Heraklion in the Crete island (57) stands in a strategic location, on the maritime route for Libya and Egypt. Gulf monarchies’ investments in local maritime infrastructures support a new pattern of urban development, where commercial ports combine with state-planned cities and mega-projects. This Gulf urbanism reflects a changed behavioural paradigm in international affairs. Nowadays, the most relevant projects are not skyscrapers, symbols of a detached, “vertical”, and lonely run towards wealth and financial power, but rather “horizontal” infrastructures, as ports and industrial/logistics complexes, archetypes of a new season of geopolitical and maritime presence. The Arab Gulf states want, plastically, to occupy space in the world, to connect, engage and contaminate with reality, seeking a multidimensional power consolidation. Port’s capacity is measured in TEUs (Twenty-Foot Equivalent Units). Container vessel capacity and port throughput capacity are frequently referred to in TEUs. Katrin Bromber-Birgit Krawietz-Christian Steiner-Steffen Wippel, “The Arab(ian) Gulf: Urban Development in the Making”, chapter 1 in Bromber- Krawietz- Steiner- Wippel (eds), Under Construction: Logics of Urbanism in the Gulf Region, London, Routledge, 2014. Calvert Jones, Bedouins into Bourgeois. Remaking Citizens for Globalization, Cambridge, Cambridge University Press, 2017. See Osama F.Elbayoumi-Ahmed Dawood, “Analysis of the Competition of Ports in the Middle East Container Ports Using HHI”, Journal of Shipping and Ocean Engineering 6, 2016. Reuters, “Qatar says new port will help circumvent Arab sanctions”, 5 September 2017, https://www.reuters.com/article/us-gulf-qatar-port/qatar-says-new-port-will-help-circumvent-arab-sanctions-idUSKCN1BG1RP; Irfan Bukhari, “Two new shipping lines to Hamad Port launched today”, The Peninsula Qatar, 17 September 2017. Peter Shaw-Smith, “Saudi port growth spurred by transhipment"
 Howard M.Hensel-Amit Gutpa, Maritime Security in the Indian Ocean and Western Pacific: Heritage and Contemporary Challenges, London, Routledge, 2018. Osama F.Elbayoumi-Ahmed Dawood, “Analysis of the Competition of Ports”. See Haifa Ahmed Al-Maashi, “From Security Governance to Geopolitical Rivalry: Iran-GCC Confrontation in the Red Sea and the Indian Ocean”, Asian Journal of Middle Eastern and Islamic Studies Vol.11, No.4, 2017. Author’s written conversation, Addis Abeba-based researcher, 24 July 2017. Eleonora Ardemagni, “The Gulf Rimland: Federalism, Geostrategy and Patronage in Contemporary Southern Yemen”, International Studies Journal, (forthcoming, 2018). Zakir Hussain, Saudi Arabia in a Multipolar World: Changing Dynamics, London, Routledge, 2016. Ali Kucukgocmen-Khalid Abdelaziz, “Turkey to restore Sudanese Red Sea port and build naval dock”, Reuters, 26 December 2017. Haaretz, “Both Iran and Israel Have Military Bases in Eritrea, Global Intel Reports”, 12 December 2012; Sudan Tribune, “Egypt to establish military base in Eritrea”, 18 April 2017; Middle East Monitor, “UAE-backed Egyptian forces arrive in Eritrea”, 4 January 2018. James Fargher, “´This Presence Will Continue Forever`: An Assessment of Iranian Naval Capabilities in the Red Sea”, Center for International Maritime Security, Capability Analysis, 5 April 2017. Author’s phone conversation with a European financial analyst, 26 February 2018. Kristian Coates Ulrichsen, “Israel and the Arab Gulf States: Drivers and Directions of Change”, Center for the Middle East, Rice University Baker’s Institute for Public Policy, September 2016.